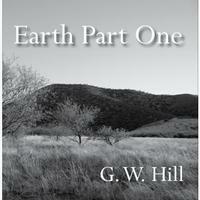 The entirety of Earth Parts 1 and 2 consists of 24 Impressions. The first CD - Part 1 is broken up into 15 short Impressions, ranging from 1:03 to 5:14. The pieces are entirely played by Gary Hill – predominantly on keyboard with sequenced electronic beats and some occasional guitar. The pace tends toward slow, almost meditative space music. But if it is meditative, it is a desolate, discomforting meditation. Not for relaxation, Earth – Part 1 forces a more existential meditation upon the immediacy of socio-ecological action. On the whole, Earth – Part 1 is more akin to electronic soundscape experiments than it is to a more traditionally composed song cycle. It sounds very much like the soundtrack to a film – and more of a Sci-Fi than terrestrially-centered epic. There is a sparse, minimal quality to the composing that would seem to work best as an accompanying audio compliment to a visual presentation such as film or dance. It seems intended to evoke imagery as might be the case with experimental multi-media installations. It is more suggestive than explicit in terms of invoking any particular story-line, though the sub-titles of several impressions do give a sense of an overarching structure that begins with an invocation of a small planet in space, moving on to specific eco-systemic disasters and extinction at the hands of humanity. 8 of the 15 Impressions bear subtitles which help guide the suggestive of this loose narrative structure. The overall tone and color are somewhat dark and unsettling, as is appropriate given the ominous theme of Earth’s destruction. Given the quasi-cinematic feel of the tone-cycle, it is tempting to try to read a narrative into the unfolding soundscape. Though not explicitly outlined in terms of narrative script, the sub-titles of some of the pieces direct this invitation to read a story within this succession of impressions. Nonetheless, the tale told seems to be left somewhat open to the viewer in terms of the details. Indeed, the dividing of the large-scale work into Impressions rather than Movements is appropriate. We are given sonic impressions that evoke feelings as much as lucid story-line. This open-endedness in terms of narrative interpretation draws the listener into a world of visualization – mentally creating one’s own version of the story-line. For this reason, I hope that the reader will indulge me in treating the pieces in terms of visual evocation of a story. These somber tone-poems invoke landscapes that shift and change with an unfolding sense of ominous, foreboding dissolution into desolation. It is a tale to be sure, but a tale that the listener must actively envision and unfold. Part 1 of the cycle to end here, fashioning a tale that is adamantly tragic, even hopeless. Ecological abuse, demise and desolation carry us on a downward spiral not only to our own obliteration, but that of our planet and, by extension, all other life-forms on Earth. This is quite somber stuff. The lo-fi aspect actually augments this sense of misuse and tragedy, as though sonically conjuring our baser selves, removing any positive application of technological development. While largely performed on modern keyboards, the lack of excessively polished production seems to undermine the positive role of technology, stripping it bare to reveal its use (really misuse) in the rampant and rapacious destruction of the planet. Not only human greed, but human technological development seems indicted by this sonic tale of woe. (Editor’s Note: This was originally released under the name "Gary Hill," but went out of print. When reissued this year, it was released under "G. W. Hill" and with a new cover. This Gary Hill is the same Gary Hill who publishes Music Street Journal – and therefore is editing this review. I have edited for grammar and layout, but not for content at all. I asked for and received an unbiased review. I will interject that while Scott’s interpretation of the material is not precisely what my intent was in recording this, it is close. I’m not going to correct it because interpretation is really the key to the whole thing. The story should be different no matter whose ears are hearing it. I should mention that this stuff was all recorded at least twenty years ago on what at the time was primitive equipment. So, the recording quality is not up to modern standards. This is essentially a re-issue of a double cassette only release from that time period. This is the first of two (the tape had too much time for one disc) parts to get the whole set released. And you can buy it at https://www.createspace.com/2058247). This is a slow processional introduction played on synthesizer with dual piano and organ patches playing the melodic line. The sparse figuration brings to mind some of Florian Fricke’s more minimalist work. The mood is somber, appropriately introducing the theme of global crisis with suitable seriousness – opening the entire suite with something sounding like a requiem. After the quietude of the first movement, the synthesized percussion beats that open this movement are an abrupt and unexpected change. Atop a repetitive, simple beat, the synthesizer plays an ambling melody using a tone that sounds like a muted trumpet patch. It is a bit curious that a movement entitled “Song of the Wild” should have such an electronic rhythmic underpinning. However, the sparseness of the melodic line does give a sense of solitary wilderness, which would probably be more evocative without the somewhat distracting beats which eventually trail off. Bending organ notes introduce this movement. These gently surging staccato pulses are faintly echoed with additional organ tones in an upper register that add to the ineffable atmospheric quality of this strangely disquieting section. Slow surging waves of keyboard washes crash against a rocky shore as though heard in the distance. This short segment is one of the more successfully evocative pieces in terms of aural visualization of a distinct place. This sea is not tamed, but ominous and uncontrolled. Again bending keyboard notes quiver over slow electronic beats. The shifting tone of the keyboard melody seems to invoke the flux of fragile eco-systems invoked in the movement’s subtitle. While the slow rhythmic pulse remains consistent, the foreground melodic line is ever-transforming, creating an ultimately unstable aural environment. Extinction is heralded by deep bass notes, played on an acoustic guitar, which are periodically punctuated with a short four-note melodic line played on the upper strings. I am not certain how this evokes the idea of extinction, other than the shift from keyboard to guitar marks an abrupt change in the sonic palette, perhaps hinting at transition to different life-forms, while others are obliterated. Dramatic, low organ swells take us to the density of the rain forest. The thicker keyboard texture invokes the almost impenetrable density of the foliage. This seeming impenetrability is sporadically broken by higher notes that suggest errant shafts of light cutting through the thicket. From the adamantly earthly we are carried to the otherworldly. Heavily echoed synthesizer blips seem to suddenly hurtle us above the forest, high into space. Eventually turning into relentless syn-beats, the sparseness of space is transformed into a barrage of beats that almost conjure an asteroid field battering a spaceship. (“In case of sonic attack…..do not panic!”). The electronic beat settles into a slow, consistent pace, while brooding organ swells and a modulating synthesizer wash swirl about it. Subtle twittering noises and squeals add to the ominous feeling before everything but the beat abruptly drops out before a sudden stop. An electronic thud announces the next movement, which is marked by low rambling tones reminiscent of an electronic bassoon. Understated, deep undercurrent beats and sounds build until joined by pulsing synthesized swells. At about the two-and-a-half minute mark a call-and-response synthesized dialog ensues over the relentless beat. While the tone is significantly less ominous than that of other movements, there is still a sense that this is not an amiable conversation between the two synthesized entities. With a clatter, a more fragmented percussive web introduces a thickly-textured wall of sound that undulates with dissonant sound. We seem to have been dropped into a noisy construction site. This evokes the rapacious building that threatens the earth’s pristine natural beauty. Mankind, in all its destructive constructive zeal, has arrived on the scene, rendering life out of balance. As the clammer of building dies down, we are left with persistent hammering of the electronic beat. The densely-layered wall of construction continues. Before long it settles into an unsettlingly discordant piano accompanied by a high, mutating syn-trumpet voice. Even as the thick aural-weave settles into a piano and syn-trumpet duet, the overarching air of discomfort remains, a sense that is augmented by the sparser instrumentation. Alternately ambling through more spacious passages and more manic bursts of piano arpeggios, this movement traverses a great landscape of uneasy contrasts. An apocalyptic swirl of hot, howling desert wind, invoked by the synthesizer seems to bring us to a barren wasteland. The rich foliage of “Impression 7 (Rain Forest)” has been denuded, leaving a barren desert over which the malevolent wind whistles its requiem. Life seems to have vanished, leaving a leveled, cratered moonscape in the place of the once verdant earth. Organ – swelling, rising and ebbing brings us to the apocalypse. But, this is not a cataclysmic crashing of sound, but rather a development off the sparse, post-apocalyptic topography left behind in the aftermath of humankind’s rapacious destruction. The undulating, solo organ suitably plays this apocalyptic coda. It does seem as though this piece might be more suitably subtitled “Requiem”, while the previous movement could conjure the Apocalyptic aftermath. Ponderous keyboard sets a slow, ominous pace, soon to be joined by a persistent syn-percussion beat. Scraping synthesized sounds almost conjure falling debris atop the beat, prompting the rhythmic pulse to increase in tempo and urgency as the keyboard sounds become more insistent, persistent, and forebodingly cataclysmic. Dark, low key-bass notes prompt another change in tempo – now slowing. Toward the end, sporadic guitar joins the fray, only to vanish, with the synthesizer, leaving the trailing electronic beat…which halts abruptly as though a heartbeat has flat-lined. It seems as though the Earth has finally given up the ghost – killed by the relentless assault of human mismanagement. The first CD of Earth ends on this somber, desolate note, leaving the listener wondering how this story could have anything but a tragic ending. Here at the end of the first CD, there is no resolution, no hope –only the silence of a dead planet.